3 leaves (8 lines and 8 staves), matted : vellum, ill. ; 495 x 375 mm. The Regensburg Antiphonary was probably made for the Dominican Convent of the Holy Cross, Regensburg (Dominikanerinnenkloster Heilig Kreuz Regensburg); purchased in 1876 at the Holy Cross monastery library sale by the book dealer Alfred Coppenrath; (subsequently the manuscript was broken up and its leaves sold separately); purchased from R. Stora, New York, in Nov. 1954. Ms. antiphonary single leaves, written and illuminated in Regensburg, Germany, ca 1310. Decoration: M.870.1: 1 historiated initial H(odie nobis) with the Nativity; M.870.2: 1 historiated initial D [should be C(um perambularet) with the crucifixion of St. Andrew, signed GERWIRCH below; M.870.3: 1 historiated initial D(iem festum sacratissime virginis) depicting St. Agnes covered with long blond hair. 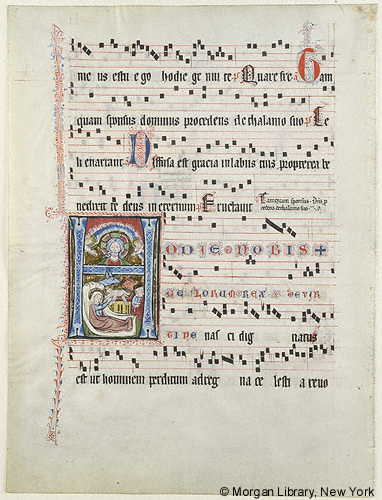 Text: M.870.1: music and text for part of the feast of Christmas; M.870.2: music and text for the Proper of St. Andrew; M.870.3: music and text for the Proper of St. Agnes. Artist: the name GERWIRCH, signed under the historiated initial on M.870.2 was first thought to be that of the illuminator, but more recent scholars hold that it refers to the manuscript's patron. Musical notation: Each leaf has 4-line staves in red ink, square notes.